A. Schneller – WHAT IS JAMES WEARING? James Andrew at A. Schneller and Sons - photo by Justin Williams - click to enlarge. As many of you may have gathered by now, I approach interior design in very much the same way a Savile Row tailor would construct a fine bespoke suit. Everything I do is highly considered, with each client’s comfort and delight being my ultimate aim. Comfort for me is one of the greatest luxuries – a room must be inviting, and well laid out for its intended purpose. Once we’ve established function and point of view, we lay out a floor plan that will in turn determine the scale and proportion for the room’s furnishings, and one of the most important parts of this equation is the selection of the upholstered pieces – often these become the most utilized furnishings in a room, so comfort and livability are paramount. I turn to my friends at A. Schneller to create the most comfortable and magnificent chairs, sofas, curtains, and other “soft furnishings” – Schneller truly is the interior designer’s equivalent of a Savile Row tailor I mentioned earlier. Every piece can be adjusted to my clients’ specifications for comfort and to the precise scale needed to fit within a particular floor plan. The A. Schneller workroom and furniture gallery is filled with some of the most iconic models of chairs and sofas ever, with many designs having originating in their families workroom – of course their quiver includes a long list of modern takes on many other classics as well. I recently created a mock room setting at A. Schneller for a client to help them visualize a grouping, pulling together a super chic collection of pieces for a small sitting room. The results I think are a rather stunning and a sophisticated mix of styles (see this enlarged image) – The Fort William sofa covered in brown satin sets the tone for this glamorous room and was originally designed by my mentor, Albert Hadley, and we’re using the “Hadley slipper chair as well. Across from the slipper chair is the “Ellis” chair and instead of a coffee table, I’m using the “Dogbone” ottoman – my client can then hold court while sitting on the very elegant “St Regis” chair. 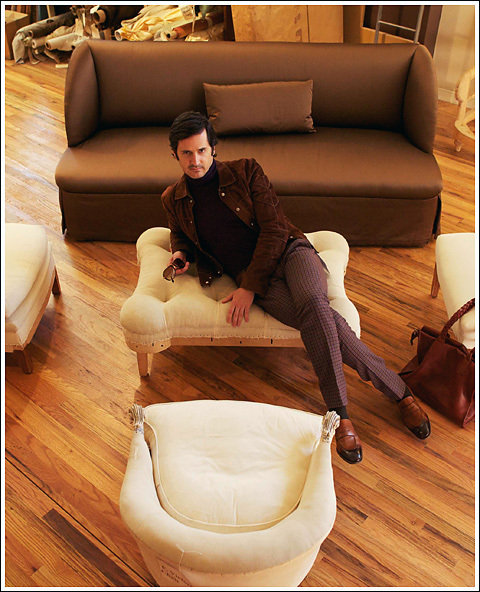 Enjoying this lovely setting, I’m reclining on the “Dogbone” ottoman wearing a pieced cognac colored suede jacket, purple feather weight cashmere turtleneck sweater, wool check pants in browns and purple, python belt with silver double horse head buckle all by Gucci, Tom Ford saddle leather loafers and sunglasses, Valfrid leather tote by Hildestahl, and my fragrance is Creed Bois du Portugal.